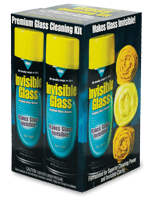 Invisible Glass cleans windows, windshields, and mirrors so well, you'll think they're invisible! Tarminator quickly loosens tar, grease, and other road grime that soap and water can't remove. 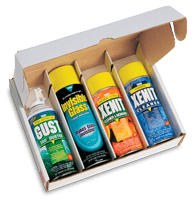 XENIT removes bubble gum, decals, adhesives, and permanent marker from carpeting, metals, glass, and more. You'll never arm-wrestle with messy paste waxes again, once you try SpeedBead and BeadMax. Trim Shine makes vinyl, rubber, and plastic look brand new. More Shine gives dull tires a clean, showroom look. You'll also get one can each of Trim Cleaner, Upholstery & Carpet Cleaner, More Shine Less Time for Vinyl Plastic & Rubber, and GUST Premium Air Duster. Plus you get 2 cleaning cloths and 1 glass cleaning towel as FREE bonuses. 17-piece kit comes in a convenient carrying case with handle. 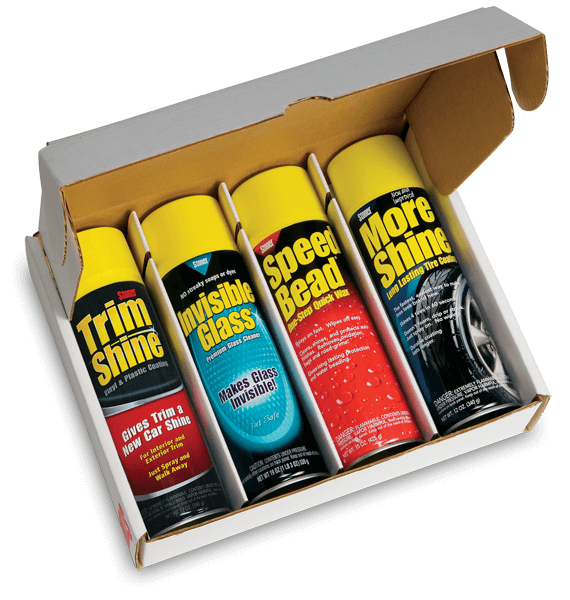 Order your Complete Vehicle Care Kit now and get FREE shipping and handling. Money-back guaranteed! If you're not amazed by Stoner products, return the unused portion within 30 days for a full refund. Most orders placed before 5pm ship same day. Bead Max is an advanced formula auto wax that provides maximum surface protection, water beading, surface shine, and gloss. BeadMax gives painted surfaces a mirror-like finish and enhances paint color and surface brilliance. BeadMax is formulated for MAXIMUM water beading. Watch water and rain race off BeadMaxed surfaces. It makes vehicle drying much easier and even lets you "wind dry" your vehicle after washing by simply driving away! Upholstery & Carpet Cleaner is the fast and easy way to remove grimy dirt from carpeting, upholstery, velour, and most fabrics. This versatile cleaner quickly removes tough dirt and stains from auto seating, floor mats, headliners, and door panels. Carpet Cleaner's special foam lifts dirt and provides plenty of cleaning power without added water that can leave surfaces saturated and wet. Surfaces dry fast after wiping. Dust with GUST! New GUST 360° Duster's special no-frost, "Spray Anyway" valve lets you spray from any angle-even upside down-without frosting (expelling contents as a liquid). Contains 8 onces Dustex 11, a 100% ozone safe, moisture-free propellant with blasting power exceeding 80 psi. Stoner Trim Cleaner is the fast and easy way to remove grimy, built-up dirt. It quickly and easily removes dirt, grime, dried food stains, fingerprints, blood, and ink from vinyl, plastic, leather and other interior automotive surfaces. Body shop friendly formula contains no silicone. 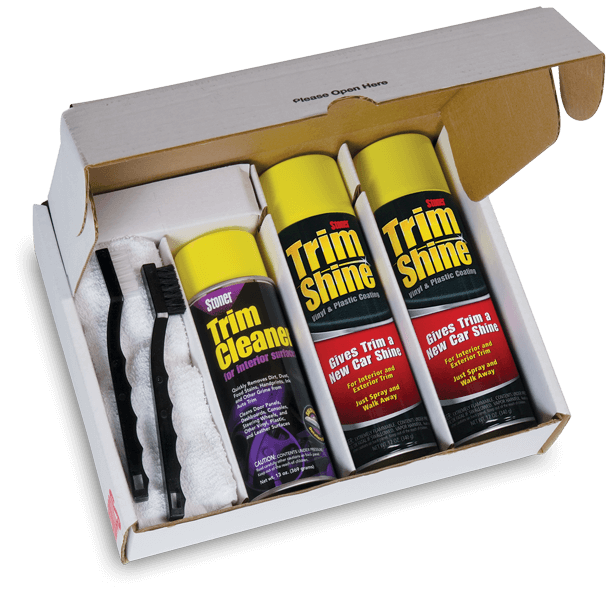 Recommended for use in or near auto body shops where silicones must sometimes be cleaned or removed before painting. When soap and water can't remove it, "Clean it with XENIT." You won't believe how quickly and easily XENIT (zee-nit) removes adhesives, tar, gum, grease, labels, ink, permanent marker, and more. With XENIT, you'll never again be frustrated trying to remove difficult gunk and grime from surfaces around your home, office, business, or garage. XENIT removes tacky, grimy dirt so well, in most cases you can simply "wipe it away."